Singapore is so crammed with Japanese restaurants that when a new one opens, we go with cautious anticipation. 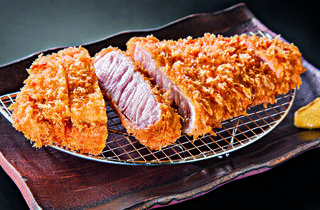 The latest to join the fray is Imakatsu, which has outlets in Roppongi and Ginza in Tokyo and claims to serve premium cuts of battered meat. We went, we ate, and let’s just say the precaution is better counsel than the anticipation. The menu offers an array of reasonably priced ($14.80- $27.70) pork fillets, mince and loins, chicken parts and even seafood. All of them are coated in breadcrumbs and dunked into two pans, each with a different temperature, to perfect a fry that is dry and crunchy. But the star here, no doubt, is the crusty slab of Kurobuta pork loin ($19.80, pictured above), butchered to include a fraction of yielding pork fat at each corner of the cut in our serving. The chicken tenderloin ($14.80) – our server admits that it is mislabelled, and says it refers instead to the two rarer slivers of tender meat under each chicken breast – has a tenderness and juiciness that can rival a leg cut. It’s an astute choice, unlike the pork loin with a stuffing of sliced garlic ($17.80), much hyped up on Imakatsu’s Facebook page. 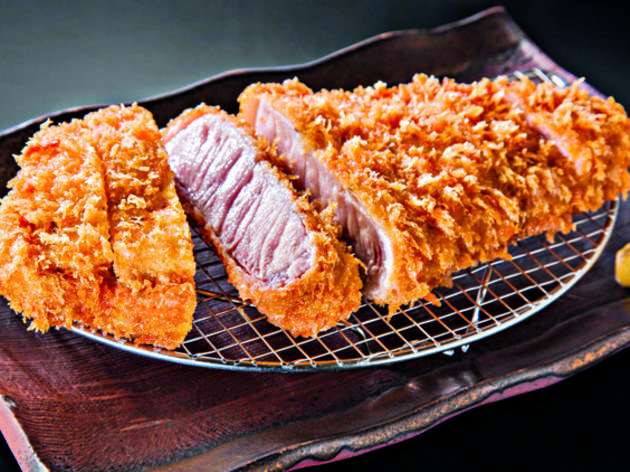 The kitchen’s mastery of the deep fryer doesn’t let the meat down, but the additional aroma from the garlic was somehow lost, rendering a piece of battered meat that tastes no different from the restaurant’s regular slab of katsu. Each set, denoted by a ‘Zen’ in the dish name, comes with a bowl of Niigata-harvested rice – it unfortunately arrives mushy – and an unlimited serving of cabbage, with a pot of thick sesame vinaigrette on every table. Is Imakatsu worth a return trip? Maybe. But only if we’re in the area and don’t have to wait in line. The restaurant is functionally good, but certainly not quite close to the best.